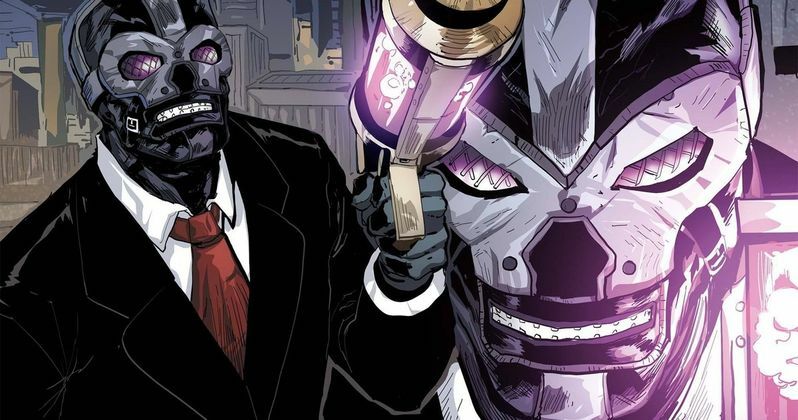 Black Mask is coming to the big screen. The upcoming Birds of Prey movie will reportedly feature the character as the main villain. Black Mask was previously rumored for Gotham City Sirens, which has been put on the back burner in favor of Birds of Prey. This movie will see the return of Margot Robbie's Harley Quinn and is likely going to be the next DC movie to film once Wonder Woman 1984 wraps up. A new report reveals that Black Mask will indeed be the big bad that Harley Quinn and her badass girl gang will be going up against in Birds of Prey. At the present time, there's no word on how he factors into the plot, nor is there any word on who may be playing the nefarious criminal kingpin of Gotham City. Black Mask has historically been portrayed as a Batman villain, so that leaves room to tie this movie to the Caped Crusader, should Warner Bros. want to go that route. Though, they seem to be much more focused on making standalone movies in the wake of what happened with Justice League. The character of Black Mask was created by Doug Moench and Tom Mandrake. He made his first appearance in the pages of DC Comics in August 1985 in Batman #386. Black Mask is generally portrayed as a sadistic kingpin and a fixture in Gotham City's criminal underworld. The man under the mask is named Roman Sionis, who murdered his wealthy parents so that he could take control of the family business. That didn't work out so well. He lost the business and his family fortune, as he proved to be a not-so-savvy businessman, and blamed Bruce Wayne and Wayne Enterprises for his failures. He then dawns the mask and heads up a gang called the False Face Society. Black Canary, Huntress, Renee Montoya and Cassandra Cain will join Harley Quinn to make up the Birds of Prey. As of right now, it doesn't look like Barbara Gordon, aka Batgirl, will be part of the team. So far, there have been no casting announcements made for the DC heroines who will be joining up with Margot Robbie. Production is expected to begin in January once Robbie finishes work on Quentin Tarantino's Once Upon a Time in Hollywood. She's also scheduled to play Harley Quinn once again in Suicide Squad 2, but there's no word currently on when filming may begin on the sequel. It was previously rumored that Penguin may be the villain, but he could be showing up elsewhere in the DC universe. Matt Reeves' The Batman would seem to make sense. Cathy Yahn, known for her debut feature Dead Pigs, has been tapped to helm the movie for Warner Bros. Christina Hodson, who also wrote the upcoming Transformers spin-off Bumblebee, penned the screenplay. Birds of Prey does not yet have a release date. We'll be sure to keep you up to date as more details are made available. This news comes to us courtesy of The Wrap.